For Busch's contribution to the collection of custom TK Helmets, his take was a no-brainer. 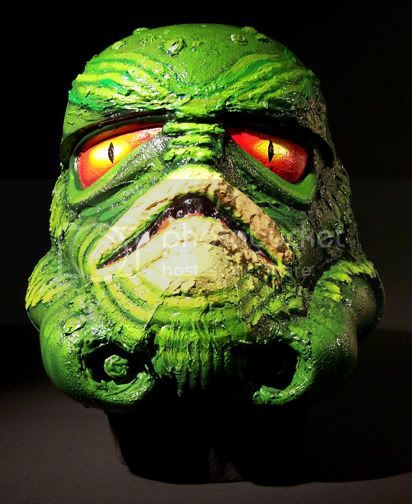 "I was 4 years old when Star Wars first hit theaters, but prior to that, I was a huge fan of the classic Universal Monsters, with The Creature from the Black Lagoon being my favorite." Comments Busch, "So when I first saw Star Wars, of course it was like nothing anyone had ever seen, but for some reason, even at 4, I saw a visual connection between the Stormtrooper helmet and The Creature." 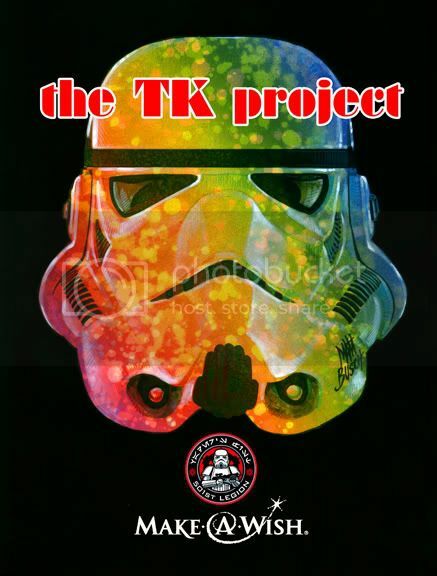 The TK Project finally gave Busch the chance to merge the two icons with an uncanny result. The process Busch used in putting it together involved some preproduction work. "After priming the actual TK helmet, I then used black acrylic gesso over the entire helmet, as I knew I'd be working with acrylics." says Busch. He then sprayed on a can of stone texture which he would paint over, but that still wasn't enough. Busch elaborates, "While the basic shape of the TK Helmet was enough to resemble The Creature, I knew some added fins, ribbed brow, and emphasis on the fishy lips would help." Using Liquitex Modeling Paste, Busch added those appendages to create the overall shape he desired. "Painting The Creature was a bit of a challenge, as most of the reference available are black and white movie stills, or other artistic representations from the movie posters or licensed products. The only problem is, the colored details are never the same. In some cases, The Creature's lips are red, sometimes green, and sometimes a fishy yellow ochre." Busch made compromises and decisions along the way to try and make an amalgam of all known reference, using an opaque acrylic technique, working from dark to light. The last step was to try and make the helmet look permanently wet, as if The Creature had just risen from the watery surface. Comments Busch, "That was the easiest. I just poured a can of acrylic gloss medium over the entire helmet and let it drip."